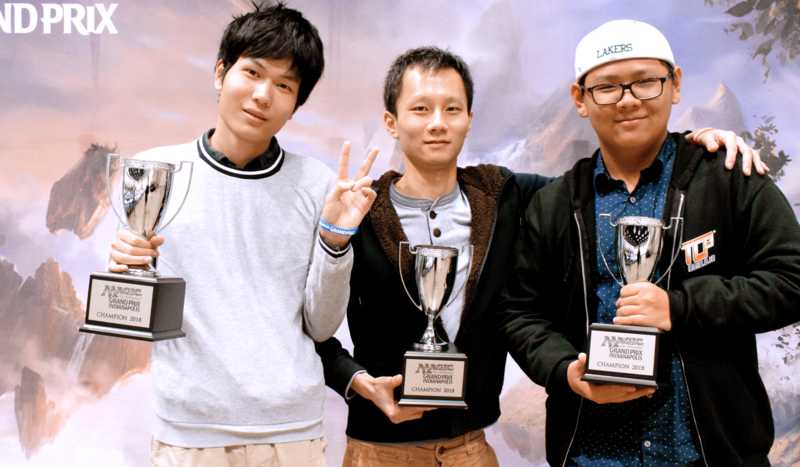 First-timers Fei Xinyu, Yeh Chih-Cheng, and Zhou Zirui pummeled through a star-studded Top 8 to win Grand Prix Indianapolis 2018! THE HASHTAG FOR GRAND PRIX INDIANAPOLIS IS #GPINDY. JOIN THE CONVERSATION. To welcome the arrival of Rivals of Ixalan, 514 teams arrived to compete in Ixalan/Rivals of Ixalan Team Limited. With so much talent rivaling for just four spots in the playoffs, it was but a bloodbath. When the dust settled, it was the first-timer trio of Fei Xinyu, Yeh Chih-Cheng, and Zhou Ziruiwho defeated Paulo Vitor Damo da Rosa, Eric Froehlich, and Ben Stark in the finals. Rounding off the Top 4 were Eric Severson, Benjamin Weitz, Neal Oliver, as well as Shahar Shahar, Lance Austin, and Oliver Tiu. Before today, the semifinalist teams each had a total thirteen Grand Prix Top 8s! For three players who had never made the elimination rounds, they were much better than expected. All three players took down the first game from their opponents in the finals, putting the superstar team in a rather tight spot. To cause the upset, the Hall of Famers would need to win at least four or five out of the remaining six games, with such little margin for error. Alas, that was not to be! Fei-Yeh-Zhou only needed two wins in six attempts - ample breathing space! Congratulations once again to Fei Xinyu, Yeh Chih-Cheng, and Zhou Zirui, our Grand Prix Indianapolis 2018 Champions! To welcome the arrival of Rivals of Ixalan, over 500 teams (more than 1500 competitors) converged at the Indiana Convention Center to complete in Ixalan block Team Limited. After eight rounds of competition, only 69 teams secured a result equal or better than 6-2 to advance. Right at the top were the trio of Hall of Famers Damo Da Rosa-Froehlich-Stark, who needs little introduction, as well as Angelo-Hicks-German who needs a little more. Check out our Day 1 Highlights and be back tomorrow as we continue bringing you the live action from the heart of Indianapolis! In less than 24 hours’ time, three Grand Prix Champions will be born!